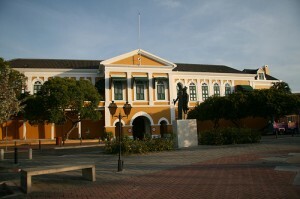 WILLEMSTAD – Tomorrow the new Members of Parliament will be sworn in by the Governor of Curaçao, H.E. Lucille George-Wout. The parties that will be represented in Parliament are PAR with 6 MPs, MAN 5, MFK 5, Korsou di Nos Tur (KdNT) 2 MPs, Movementu Progresivo 1 and PIN 1. Former Minister of Education and current leader of Un Korsou Hustu, Omayra Leeflang will not return as Member of Parliament. Also, Melvin Cijntje of the Pueblo Soberano party (PS), Carlos Monk of KdNT and Independent MPs, Edward Braam (former PAR) and Gassan Dannawi (former MAN) will not return as Members of Parliament. The ceremony will take place tomorrow in the Governor’s Palace and begins at 8:30 in the morning.